Our coffee is curated and procured from around the globe. 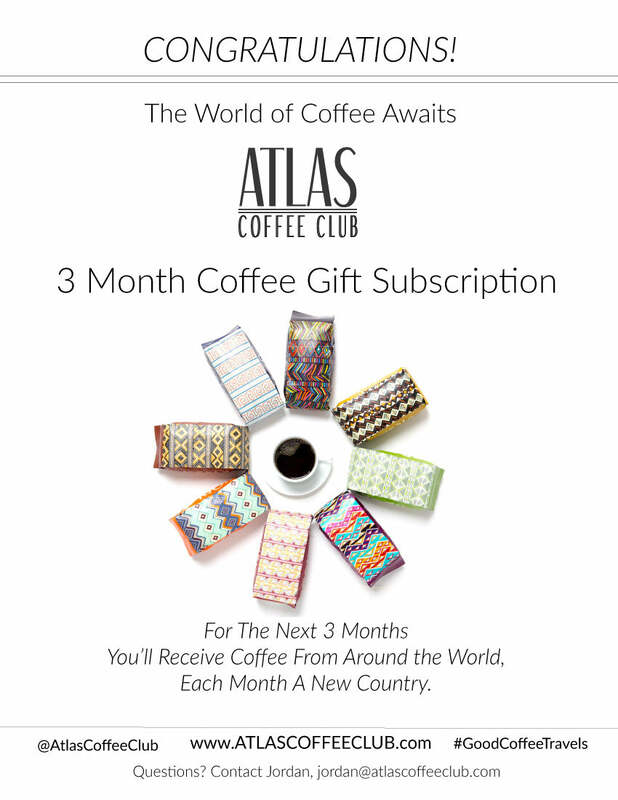 With our mission to share the world of coffee each month we introduce coffee from a new region or country. Ethiopia, Congo, Rwanda and beyond, check out our product descriptions for more information about the various farms we source from or feel free to reach out and ask us! On average about 50% - 60% of the coffees we offer are either fair-trade certified, direct trade, or go through a coffee cooperative. All of the coffee we source uses sustainable farming practices, which sounds "Jargon-y" but what it boils down to is we pay above market prices for our coffee to ensure the farms can produce high quality coffee year over year. The fair-trade movement is an amazing movement that really helped move the needle for mass producers of coffee ensuring fair wage for large coffee growers where the cost / quality of coffee was traditionally lower. The rise of the specialty-grade coffee market (top 5% of coffee in terms of quality) has driven up demand and price for top-quality coffee which has lead to much higher pay for farmers who farm specialty-grade coffee. This isn't to say that there aren’t still some wage issues for a small number of specialty coffee growers, but the vast majority (and all of the farms we work with) pay above fair-trade prices. Not only because it's the right thing to do, but also because it helps invest in quality coffee year after year. How fresh is the coffee? Each batch of coffee is roasted to order! Our team roasts every morning, with each batch of coffee being roasted often within hours if not minutes of being shipped out. Your coffee is so fresh that we actually recommend waiting about 7 days off roast to brew it so the coffee can properly degas. With that, the time it takes for the coffee to degas to reach optimal flavor coincides perfectly with the time it takes for the coffee to ship so you're receiving the freshest coffee possible! Cheers! Should the coffee have a vacuum seal? You'll notice that our coffee isn't vacuum sealed. And the reason why is because you don't need it because we roast your coffee to order. A vacuum seal is only needed when buying coffee off the grocery store shelf where the coffee has been sitting for weeks if not months! As the coffee you order from us is roasted to order, you're getting the freshest coffee possible! And not coffee that has been roasted 30+ days ago! Do you flavor the coffee? We do not add any flavors to our coffee. The only ingredient in our coffee is coffee. Yes! Your coffee beans are intended to be dry. Dry coffee beans are not a bad thing. And for every coffee roast type (other than a very darkly roasted coffee) the coffee bean consistency should be dry. The consistency of the bean (dry or oily) does not indicate freshness or a lack thereof. If you find that the coffee is not strong enough? Or that the coffee is too acidic, email us so we can get you a coffee that matches your roast preference! What are the tasting notes you list? The tasting notes are flavors we have identified within each coffee. Vanilla, almond, maple, berry, chocolate and more are all flavors that you can discover in single-origin coffee. Much like wine, coffee boasts a bounty of unique tastes, in fact, coffee has more than 800 aromatic and flavor compounds, wine only has 200. If you’d like to learn more about flavors found in coffee, visit The Specialty Coffee Association of America’s Flavor Wheel guide. Do I have to use your brewing recommendations? You don’t have to, but we encourage that you do if you can. How much coffee comes in each bag? 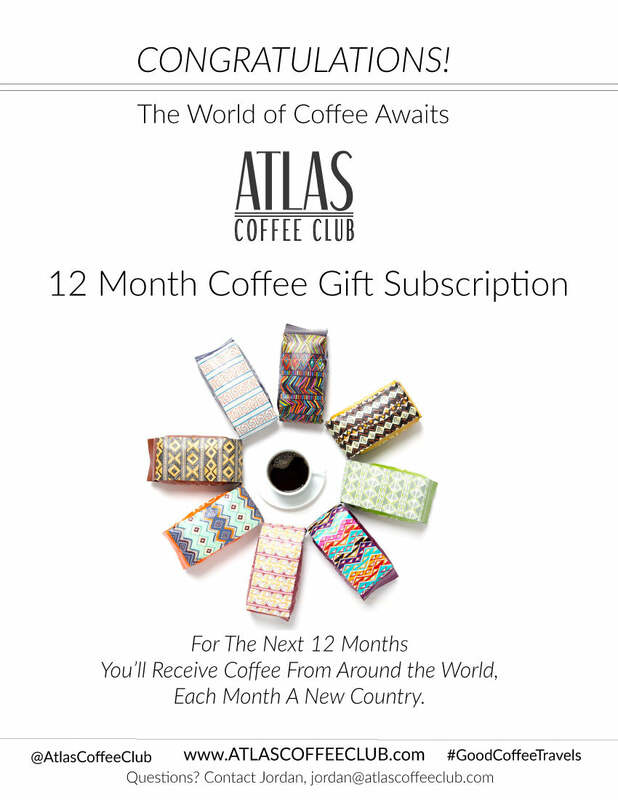 We offer both 12oz and 6oz bag options for monthly subscriptions and 12oz bags for gift subscriptions. Each 12oz bag will serve about 30 cups of coffee. At this time we do not offer a decaf option. Can I brew with a Keurig or use a Kcup? Yes! If you use a Keurig coffee maker, ask us about re-usable Kcups! What's another fun way to say coffee? Here’s 50 ways to say coffee… because anything as great as coffee deserves multiple titles. What is your rewards program? Our rewards program was designed to enhance every part of your coffee subscription with us. How do I become a member of your rewards program? When you sign up for a monthly subscription, activate your account and you’re all set. Can I cancel my account and keep my points? At this time we’re only able to save your points while you’re an active subscriber. We offer both Whole Bean and Ground Coffee options. The Ground Coffee is set for a standard drip machine. You can easily make changes to your coffee grind type by logging into your account > accessing your portal > and then selecting your preference. Want to receive coffee on a different schedule? We can accommodate. 1 bag of coffee every week or 1 bag of coffee every 2 months, we work with your schedule. Want more coffee per shipment? Want to update the amount of coffee you receive in each shipment? Choose from (1) 6oz Bag, (1) 12oz Bag, (2) 12oz Bags, (3) 12oz Bags, or (4) 12oz Bags of coffee per shipment. You can easily make this update by logging into your account > accessing your portal > and then changing your bag quantity. What can I do with an account? Please email us so we can help. I didn’t receive an account email confirmation? Please email us so we can confirm your email on file and re-send a confirmation. Yes. You can easily login to your account to cancel. Please email us if you need further assistance. American Express, Visa, Master Card, Discover, Capital One, + all major credit cards & PayPal are all accepted. I have a subscription – when will I be charged? According to your subscription plan with us, you will be charged when your next order is being prepared. For example, if you receive coffee once a month, you will be billed once a month when your coffee is being prepared to be shipped to you. I bought a gift subscription – when will I be charged? You will only be charged once when your gift is purchased. Your gift will not automatically renew upon completion. How do I update my card? As you can see, we charge flat rate shipping at the best cost possible. Sadly, free shipping is a myth; the USPS does not hand out free shipping. Other brands will build shipping costs into their product prices. We do our best to provide the best coffee at the best price point and will continue to make the world of specialty coffee more accessible. Can my gift recipient make changes after I sign them up? Do you offer gift notes? We do! After you’ve selected which gift you’d like to share, i.e. 3, 6, or 12 months, you will see ADDITIONAL GIFT OPTIONS, below this you will see the option to check a box to send a gift note. Visit our one of a kind World Tour of Coffee Gifts. Can I buy today and ship at another time? Yes. After you’ve selected which gift you’d like to share, i.e. 3, 6, or 12 months, you will see additional gift options, below this you will see the option to check a box for choose first shipment date. Visit our one of a kind World Tour of Coffee Gifts. Do you have a certificate I print out & share with the recipient? 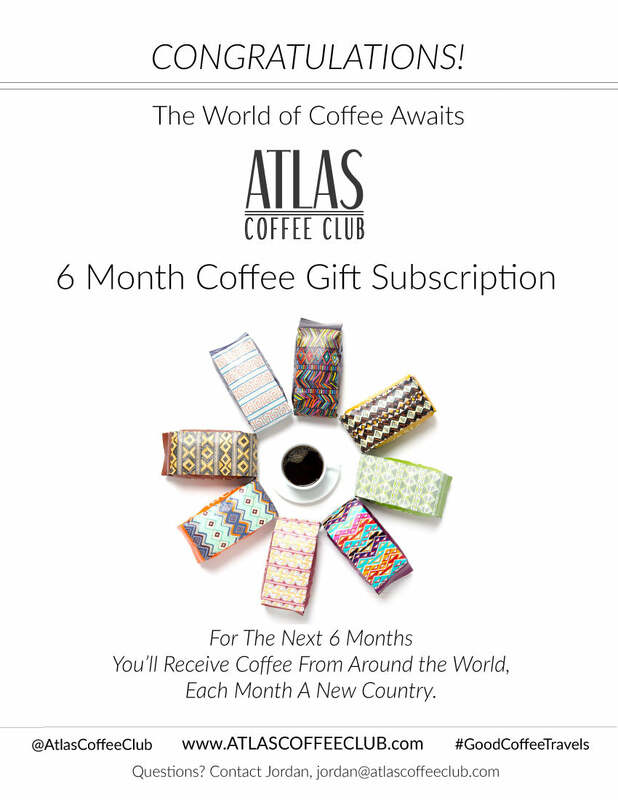 Email us at support@atlascoffeeclub.com and we'll send you one! Do you include prices in the box? We do not. The gift recipient will not see any form of invoice or price. Yes you can. We offer light to medium and medium to dark roast options. You can select a Light Roast plan, Dark Roast plan, or an All Roast Type plan. Can I select a Ground or Whole bean? Yes you can. We offer both Whole Bean and Ground coffee options. How do I extend a gift? You can email us and we’ll keep the coffee world tour going! I received a gift – How do I change my preferences? You can email us and we’ll help facilitate any roast preference, grind type, or shipping schedule changes! Can I update my coffee grind preferences? You can. We offer both whole bean and ground coffee options – let us know which you prefer. Can I update my coffee roast preferences? I received a gift – How do I learn more? What can we help you with? Would you like to learn more about coffee from around the world? Check out our coffee blog – Coffee Club Culture. Want to learn how to make better coffee at home? Check out our Coffee Brew Guides. How do I get a coffee flavor wheel to use at home? I want to brew better coffee at home, any recommendations? Where we ship & timeline? Please note that international shipping (Canada only) is subject to potential delays in accordance with customs and other operations without our notice. We work diligently with our shipping provider to make sure your coffee is delivered within the aforementioned timeline but do appreciate your patience if things don't go according to plan. Can't wait for you to try some coffee :) Let us know if you have any questions. Shipping internationally costs more than what is listed on our website before checkout. Please expect an additional charge starting at $6 per shipment.